I must admit I have been drifting over the past few weeks, evidenced by the lack of substance in my blogposts recently. I found it so hard to pinpoint what matters most to me for the day, thoughts or happenings that meant at least something. There were none. Yesterday's renewal was so needed. As I pushed myself back into reading Carson's A Call to Spiritual Reformation, I was drawn to Colossians 1:9-14. I finished reading the book (or rather, I finished skimming it, as I found it quite repetitive the second round I'm reading it this time). I began to hunt for something that can help further uplift me in the presence of my Heavenly Father. I decided to check out Tullian Tchividjian. I remember reading Glorious Ruin back in November 2013 and loved it. In checking the available volumes in Kobobooks.com, I decided on this one, which proved to be an excellent pick. What attracted me to it was the fact that I have been feeling very exhausted lately. And on top of that, it has been years of observation that I have come to the conclusion that a performance-based organisation, how logical and necessary it is, it is not the answer to success. Which is why the trend is now moving to employee engagement but that is another discussion. I finished the 200 plus page book in just one day. It was an excellent read. I learnt a lot about law and grace, I can now finally see the difference between the two especially to understand Paul's treatment of them in Romans. For me to understand grace as it is, an undeserved love, a one way love, it helps me divert the attention I give myself, the act of constant inward looking that I always catch myself in, to the grace giver, God himself. An identity based in the one-way love of God does not take into account public opinion or, thankfully, even personal opinion. It is a gift from Someone who is not you. As my friend Justin Buzzard wrote recently, “The gospel doesn’t just free you from what other people think about you, it frees you from what you think about yourself.” In other words, you are not who others see you to be, and you are not who you see yourself to be; you are who God sees you to be—His beloved child, with whom He is well pleased. One-way love frees us from the burden of having to establish our own worth, which means we can actually enjoy and appreciate the gifts God has given us on their own terms rather than as means to an end, condemning ourselves for not being good enough stewards. The Gospel, in other words, liberates us to be okay with not being okay. We can stop pretending that we are anyone but who we actually are. Which means we can admit our weaknesses to ourselves without feeling as if the flesh is being ripped off our bones. We can take off our masks and explore our self-justifying compulsions from a safe distance. ...you don’t have to win—you’re free to lose. And nothing in this broken world can beat a person who isn’t afraid to lose! You may even find you’re free enough to say crazy, risky, counterintuitive stuff like, “To live is Christ and to die is gain”! ...both God’s Law and God’s Gospel are good and necessary, but both do very different things. Serious confusion—in both theology and daily life—happens when we fail to understand their distinct job descriptions. We’ll wrongly depend on the law to do what only the Gospel can do, and vice versa. The Law reveals sin but cannot remove it. It prescribes righteousness but is powerless to produce it. The Law is impotent—it has no creative power, it cannot inspire. It offers us nothing but condemnation and death. The Law apart from the Gospel can only crush; it can’t cure. That satisfies me but only enough. I needed to understand it better. What do I do then? I desire to live a life that is solely dependant on God's grace. I will look to him for my identity and not to myself. And then what? I believe this quest for me is Spirit-led. As I was updating my book list, I noticed this other book in my recommended list - After You Believe: Why Christian Character Matters by NT Wright. It was already way into the night when I finished reading One Way Love, but I was so intrigued, I started reading the preface and part of the first chapter in the preview copy. 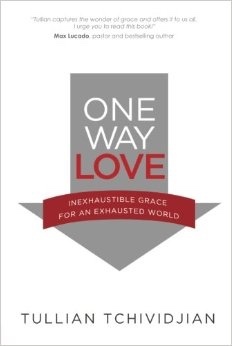 I find that it should be an excellent follow up to One Way Love, but thought I'd leave it till the next morning.